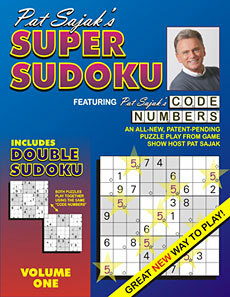 Pat Sajak's Code Number Super Sudoku is not just another Sudoku puzzle. It is based on Pat's patent-pending "Code Number" and "Code Letters" puzzle-solving system. This unique way of playing a Sudoku puzzle is fun, challenging, and will always be exclusive to Pat Sajak! Game show host, Pat Sajak, and his team of puzzle and game developers have come up with a new patent-pending puzzle play called "Code Letters" and "Code Numbers". 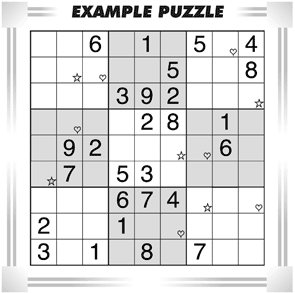 Both "Code Letters" and "Code Numbers" puzzles incorporate code symbols into answer boxes that correspond with each other. For example, in the puzzle to the right, some of the boxes have been "coded" with STARS and others with HEARTS. All the STARS represent the same number and all the HEARTS represent a different number. If, for example, you were certain one of the boxes "coded" with a STAR was a 1, you could fill in all the 1s through the puzzle on the corresponding boxes "coded" with the STAR symbol. The term "Sudoku" loosely translates to "all the numbers must remain unmarried." Even though Sudoku has recently become very popular, it's actually been around for decades. It might look complicated, but it's really not. The goal is to place numbers onto the grid (based on the location of starting numbers) so that when the puzzle is complete, each 3x3 box, each row and each column contains the number 1 through 9 only once. These samples are in the Adobe Acrobat (.pdf) format.